This document provides a reference to the basics of HAL. More detailed information can be found in the man page for halcmd: run man halcmd in a terminal window. To see the HAL configuration and check the status of pins and parameters use the HAL Configuration window on the Machine menu in AXIS. To watch a pin status open the Watch tab and click on each pin you wish to watch and it will be added to the watch window. The command loadrt loads a real time HAL component. Real time component functions need to be added to a thread to be updated at the rate of the thread. You cannot load a user space component into the real time space. Adds function functname to thread threadname. Default is to add the function in the order they are in the file. If position is specified, adds the function to that spot in the thread. Negative position means position with respect to the end of the thread. For example 1 is start of thread, -1 is the end of the thread, -3 is third from the end. You have to add a function from a HAL real time component to a thread to get the function to update at the rate of the thread. Usually there are two threads as shown in this example. Some components use floating point math and must be added to a thread that supports floating point math. The FP indicates if floating point math is supported in that thread. base-thread (the high-speed thread): this thread handles items that need a fast response, like making step pulses, and reading and writing the parallel port. Does not support floating point math. servo-thread (the slow-speed thread): this thread handles items that can tolerate a slower response, like the motion controller, ClassicLadder, and the motion command handler and supports floating point math. The command loadusr loads a user space HAL component. User space programs are their own separate processes, which optionally talk to other HAL components via pins and parameters. You cannot load real time components into user space. to wait for the component to become ready. The component is assumed to have the same name as the first argument of the command. to wait for the component, which will have the given <name>. This only applies if the component has a name option. name a component when it is a valid option for that component. In English it means loadusr wait for name spindle component gs2_vfd name spindle. The command net creates a connection between a signal and one or more pins. If the signal does not exist net creates the new signal. This replaces the need to use the command newsig. The optional direction arrows <=, => and <=> make it easier to follow the logic when reading a net command line and are not used by the net command. The direction arrows must be separated by a space from the pin names. In the above example home-x is the signal name, axis.0.home-sw-in is a Direction IN pin, <= is the optional direction arrow, and parport.0.pin-11-in is a Direction OUT pin. This may seem confusing but the in and out labels for a parallel port pin indicates the physical way the pin works not how it is handled in HAL. The same signal-name can be used in multiple net commands to connect additional pins, as long as the rules above are obeyed. This example shows the signal xStep with the source being stepgen.0.out and with two readers, parport.0.pin-02-out and parport.0.pin-08-out. Basically the value of stepgen.0.out is sent to the signal xStep and that value is then sent to parport.0.pin-02-out and parport.0.pin-08-out. 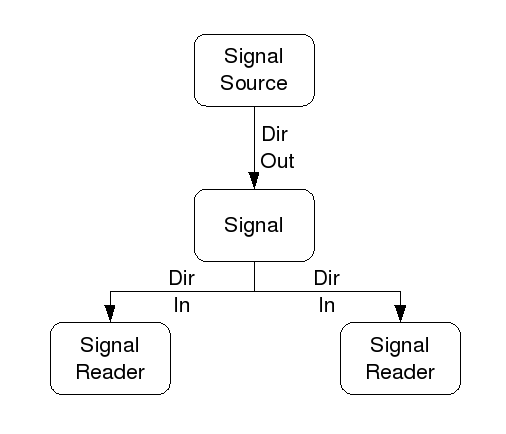 Since the signal xStep contains the value of stepgen.0.out (the source) you can use the same signal again to send the value to another reader. To do this just use the signal with the readers on another line. An I/O pin like encoder.N.index-enable can be read or set as allowed by the component. The command setp sets the value of a pin or parameter. The valid values will depend on the type of the pin or parameter. It is an error if the data types do not match. Some components have parameters that need to be set before use. Parameters can be set before use or while running as needed. You cannot use setp on a pin that is connected to a signal. The command sets sets the value of a signal. The command unlinkp unlinks a pin from the connected signal. If no signal was connected to the pin prior running the command, nothing happens. The unlinkp command is useful for trouble shooting. The following commands are depreciated and may be removed from future versions. Any new configuration should use the net command. These commands are included so older configurations will still work. The command linksp creates a connection between a signal and one pin. The linksp command has been superseded by the net command. The command linkps creates a connection between one pin and one signal. It is the same as linksp but the arguments are reversed. The linkps command has been superseded by the net command. the command newsig creates a new HAL signal by the name <signame> and the data type of <type>. Type must be bit, s32, u32 or float. Error if <signame> all ready exists. More information can be found in the HAL manual or the man pages for halrun. A bit value is an on or off. A float is a floating point number. In other words the decimal point can move as needed. float values = a 64 bit floating point value, with approximately 53 bits of resolution and over 1000 bits of dynamic range. An s32 number is a whole number that can have a negative or positive value. A u32 number is a whole number that is positive only. If you used the Stepper Config Wizard to generate your config you will have up to three HAL files in your config directory. my-mill.hal (if your config is named my-mill) This file is loaded first and should not be changed if you used the Stepper Config Wizard. custom.hal This file is loaded next and before the GUI loads. This is where you put your custom HAL commands that you want loaded before the GUI is loaded. custom_postgui.hal This file is loaded after the GUI loads. This is where you put your custom HAL commands that you want loaded after the GUI is loaded. Any HAL commands that use pyVCP widgets need to be placed here. Two parameters are automatically added to each HAL component when it is created. These parameters allow you to scope the execution time of a component. Time is the number of CPU cycles it took to execute the function. Tmax is the maximum number of CPU cycles it took to execute the function. Tmax is a read/write parameter so the user can set it to 0 to get rid of the first time initialization on the function’s execution time. HAL contains several real time logic components. Logic components follow a Truth Table that states what the output is for any given input. Typically these are bit manipulators and follow electrical logic gate truth tables. The and2 component is a two input and gate. The truth table below shows the output based on each combination of input. The not component is a bit inverter. The or2 component is a two input OR gate. The xor2 component is a two input XOR (exclusive OR)gate. An and2 example connecting two inputs to one output. In the above example one copy of and2 is loaded into real time space and added to the servo thread. Next pin 11 of the parallel port is connected to the in0 bit of the and gate. Next pin 12 is connected to the in1 bit of the and gate. Last we connect the and2 out bit to the parallel port pin 14. So following the truth table for and2 if pin 11 and pin 12 are on then the output pin 14 will be on. The weighted_sum converts a group of bits to an integer. The conversion is the sum of the weights of the bits that are on plus any offset. The weight of the m-th bit is 2^m. This is similar to a binary coded decimal but with more options. The hold bit stops processing the input changes so the sum will not change. The following syntax is used to load the weighted_sum component. Creates weighted sum groups each with the given number of input bits (size). To update the weighted_sum you need to attach process_wsums to a thread. This updates the weighted_sum component. In the following example clipped from the HAL Configuration window in Axis the bits 0 and 2 are true and there is no offset. The weight of 0 is 1 and the weight of 2 is 4 so the sum is 5.